Property 1: Penthouse overlooking Mar Menor golf course. FREE WIFI. Lovely swimming pool. Property 2: Two Bedromed Apartment With Stunning Golf Course Views Free WIFI And UK TV. Property 3: Ground floor apt 2 bed/ 2 bath, 1min from shops restaurantss, 5 mins beach. Property 32: Beautiful, South facing, Front line ground floor apartment with private pool. 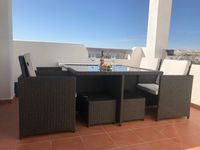 2 bed penthouse, near beach, pool facing balcony, WiFi, air con, roof terrace. Property 35: 2 bed penthouse, near beach, pool facing balcony, WiFi, air con, roof terrace. Property 40: Superb Central Location. Fully Equipped Apt plus WiFi & inclusive cleaning fee. Property 45: Luxury apt, close pool on Polaris World's La Torre Golf Resort.